For instance, a recent case, successfully handled by maritime attorney Mason Kerns, involved the cruise’s failure to supervise children going down a water slide which created a dangerous bottleneck of children at the end of the slide. Ultimately, this caused a young minor passenger to be kicked in the back and lose several permanent teeth. The cruise line advertised to parents that their children could safely enter and have fun at their ship’s mini water park. However, not a single crewmember was supervising the slide in question. Other cases involve children falling and becoming gravely injured while taking part in cruise-organized activities that are specifically tailored to children, like “Capture the Flag”. Unfortunately, many crewmembers in charge of running these minicamp-like activities are inadequately trained and often fail to properly supervise children, let alone a large group of children. This week, a multi-million dollar settlement reached by Thomas Scolaro and Justin Shapiro, on behalf of a young boy who sustained a traumatic brain injury, was approved by the Court. In that case, the defendant cruise line failed to inspect its own basketball court. When the minor child fell while running down the court, as is foreseeable when children play, an unprotected fixture of the court caused the boy to sustain a catastrophic skull fracture and brain injury. The boy remained in extremely critical condition during transport to the hospital where he underwent emergent surgery (craniotomy) (1) to alleviate pressure against the brain, (2) to stop the subdural bleeding, (3) to evacuate a large hematoma, and (4) to repair a large skull fracture. In every personal injury case against a cruise line that involved a child, it is imperative that the family’s attorneys and their expert gain access to the ship to inspect the conditions of the area where the incident occurred. Equally paramount is to request and to acquire as soon as possible the video footage captured by the ship’s closed-circuit surveillance system. 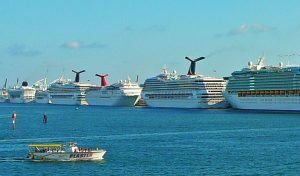 Even without filing an immediate lawsuit, an experienced maritime lawyer will be able to compel a cruise line to produce the surveillance video. This will allow the family to understand how the incident occurred and will help their lawyers and retained experts to couch in their complaint each and every act of negligence committed by the cruise line unveiled by the video. While cruise lines advertise to parents with children, most if not all cruise ships are extremely unsafe for young and minor passengers. Railings can be adequate for an adult population, but at the same time extremely dangerous for children. No one would expect a cruise ship to be “childproofed,” however cruise lines must be held liable when they precisely target and invite families with young children to board an unsafe ship.